Houses on Bunker’s Hall, one of which was a public house – The Feathers or The Falcon. Photo courtesy of V. Hopkinson. This pair of houses are nos. 9 & 11 Bunker’s Hill. 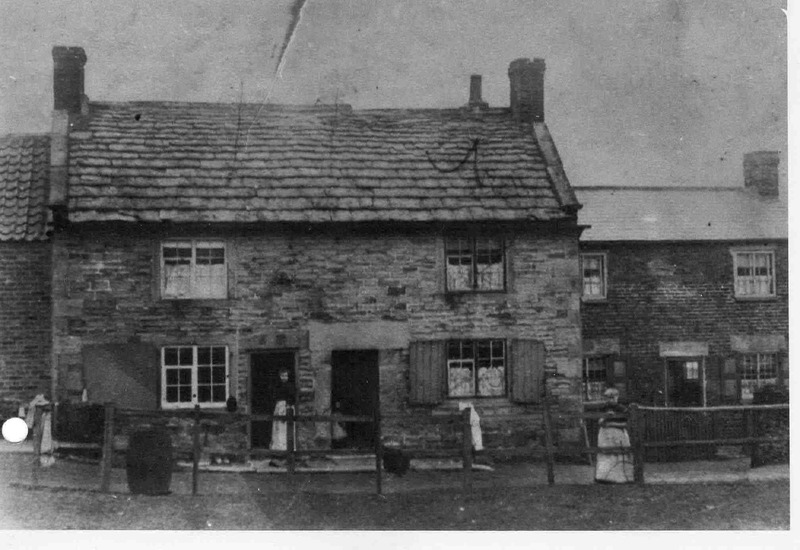 No 9 (on the right) was occupied by my gt x 2 grandparents, James and Fanny Mallinder and their children from sometime between 1871 and 1881. They came from Bridge. After their deaths the house continued to be occupied by my gt grandparents, Fred and Harriet Mallinder and my granddad, Harry. Sometime between 1901 and 1911 they moved next door to 11 Bunker’s Hill and continued to live there until Fred’s death in 1932. Fred built and rented out a terrace of house known as 4-10 Bunker’s Hill, which were probably behind 9 & 11, and 40a to 46a Ashley Lane, which is where my grandparents, Harry and Dorothy Mallinder lived and where with my dad, Ralph, grew up, until about 1944 when the family together with Harriet moved to Peveril Road, Newbold, Chesterfield. My dad tells me that Fred had an orchard attached to his house. I wonder whether there might be a connection with this and the naming of Mallinder Close on the housing estate nearby.